US markets are largely positive today, due in large part to positive earnings-season economic data and strengthening unemployment data, according to a consensus of financial reporters. However, such is not the case for Electronic Arts, which is trading down more than 6 percent after Brean Murray Carret & Co. analyst Todd Mitchell lowered the company's price target from $28 to $22. 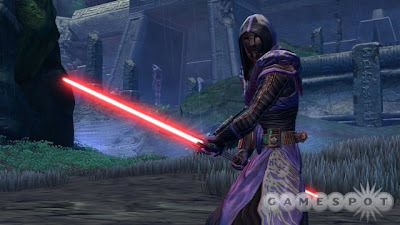 As reported by Market Watch, Mitchell's reassessment of EA came about due to what he termed "creeping concerns" over the future of EA's recently launched massively multiplayer online role-playing game Star Wars: The Old Republic. "Specifically, initial sales appear to be below expectations, and casual observation of early play is causing us to rethink our churn assumptions," Mitchell said in a note to investors. Released to a strong critical reception on December 20, The Old Republic sold more than 1 million units during its first week of availability. That tally proved to be more than what EA could handle, as the game's launch was marred by long wait times to access many servers. Mitchell's analysis of The Old Republic's situation isn't without its detractors. Speaking with GameSpot, Electronic Entertainment Design and Research's Jesse Divnich emphasized that it is far too early to measure the game's long-term potential. "Some sell-side analysts have such bad tunnel vision on the market that they fail to understand the mechanics of the MMO vertical," Divnich said. "Whether MMO, console game, mobile, or social, each have a completely different business model. It is erroneous to apply success metrics from other verticals to the MMO market and that is exactly what a lot of analysts are doing." Divnich also noted that EA still has a number of options to boost player numbers and engagement, should the company deem it necessary. Baird & Co. analyst Colin Sebastian echoed Divnich's sentiment, telling GameSpot, "The game doesn't appear to be the smash hit that some had [thought], but I think it's way too early to be signing the death warrant."